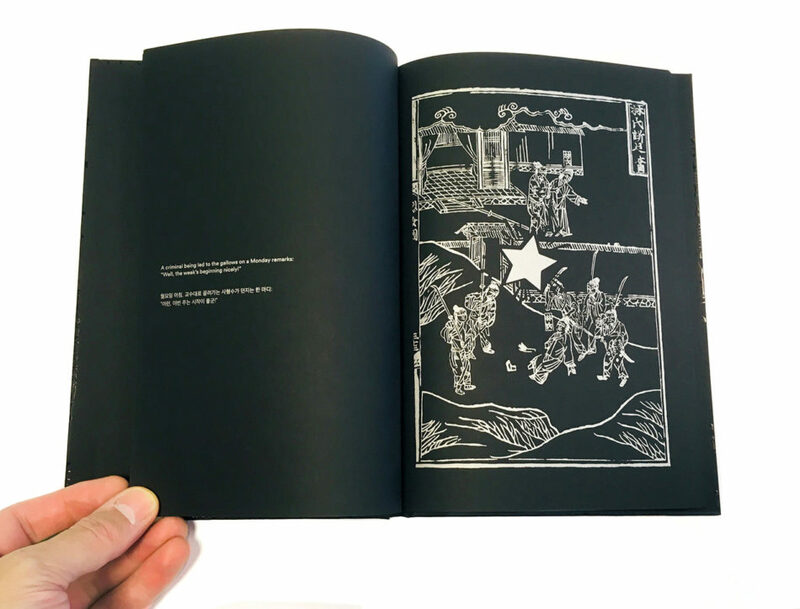 Black Book is an artist’s book that joins two distinct threads of disparate cultures and histories — Confucian virtues and black humour — inquiring into contemporary ideologies such as patriarchy and technological determinism. The illustrations in Black Book are borrowed from a 15th century Confucian text titled Illustrated Conduct of the Three Bonds. The woodblock print book was first published in 1431 by the royal dynasty of the time, as part of an effort to disseminate Confucian principles throughout the kingdom. In the years that followed its appearance, the book was subsequently restructured and reprinted numerous times throughout the Joseon period. Black Book draws primarily from a specific edition now housed at the National Library of Korea, the exact publication date of which is unknown. The majority of the images in Black Book are appropriated from the volume called “Virtuous Women”. The original jests and cartoon effects in Black Book were collected from various online sources, literary texts, or in some cases by word of mouth. Some are unaltered, but many have been edited to reflect or invoke a more contemporary context. True to the form of black humour, present interpretations belong to the audience.